I love infographics! Recently, The New York Times carried an interesting article, with a great infographic, by Don Leonhardt, titled Is Your Religion Your Financial Destiny? The article focuses on the intricate relationship between religious affiliation and income earned. Readers should note that the data, culled from a Pew Forum on Religion and Public Life survey, relates to folks living in the United States. 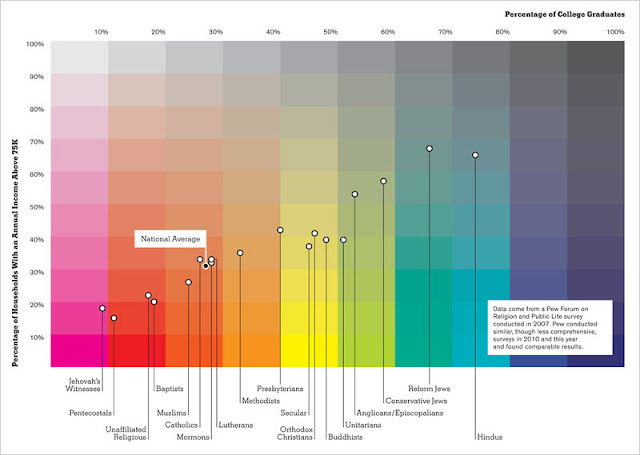 However, irrespective of the country, the infographic provides fascinating insight into the economic differences among the various religions in the United States. Like all bits of economic data, surveys, and infographics, this one too may have its share of detractors. It’s ok! Says the author: "The most affluent of the major religions — including secularism — is Reform Judaism. Sixty-seven percent of Reform Jewish households made more than $75,000 a year at the time the Pew Forum on Religion and Public Life collected the data, compared with only 31 percent of the population as a whole. Hindus were second, at 65 percent, and Conservative Jews were third, at 57 percent. On the other end are Pentecostals, Jehovah’s Witnesses and Baptists.... Some of the income differences probably stem from culture. Some faiths place great importance on formal education." So if there is one thing that connects the richest religions, it is education. And that is what makes their followers earn more. P.S. : Yesterday I had mentioned that today's entry will focus on the latest developments in Libya; now this will appear tomorrow. Guess the above data bears testimony to the prevailing situation in almost all the countries.Take the countries where education is at a minimal,like some of the African and Islamic countries.The condition of the people there is deplorable and pathetic to say the least.Education really does help in building the nation.And it takes an impartial view at the ways of the world.Religious fanaticism and education can never go hand in hand.Some of the perpetually 'developing nations' (pun intended) would have been on the high road to development if their equally fanatical Governments had realised this simple truth.